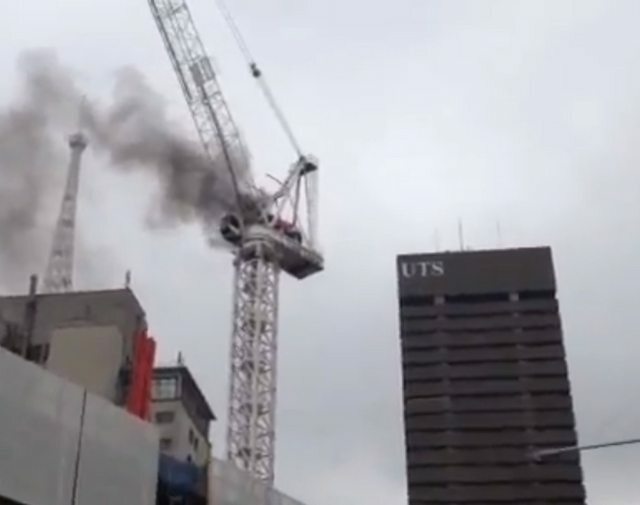 This is a video showing how a construction crane was on fire and ended collpasing against a university building of UTS, Sydney, Australia. This happened this morning, Tuesday November 27th, 2012. UTS representatives said no one is injured. You may be already aware of the incident that happened on the Broadway Building site earlier this morning. The Lend Lease crane on site caught fire, with its arm collapsing on to the building site. We are happy to report no-one was injured and all staff and students in Building 10 were successfully evacuated following UTS protocol. The site and surrounds have been secured and the building site is structurally safe. Building 10 activities have been suspended until the all clear is given by security services. It will be at least three hours until the building might be re-opened, and students should go home or make other arrangements. If you are affected by the building’s closure and cannot return home – you’ve parked your car or bicycle in building 10 or you have personal possessions left inside – please come to the Student Services on Level 6 of the Tower building to speak with Student Services representative. If you have further enquiries, please direct them to student.services@uts.edu.au. ABC News reporting with another video from other angle where the fire in the crane can be clearly watched.